Now this is something that i am sure you will all be able to have some fun with! 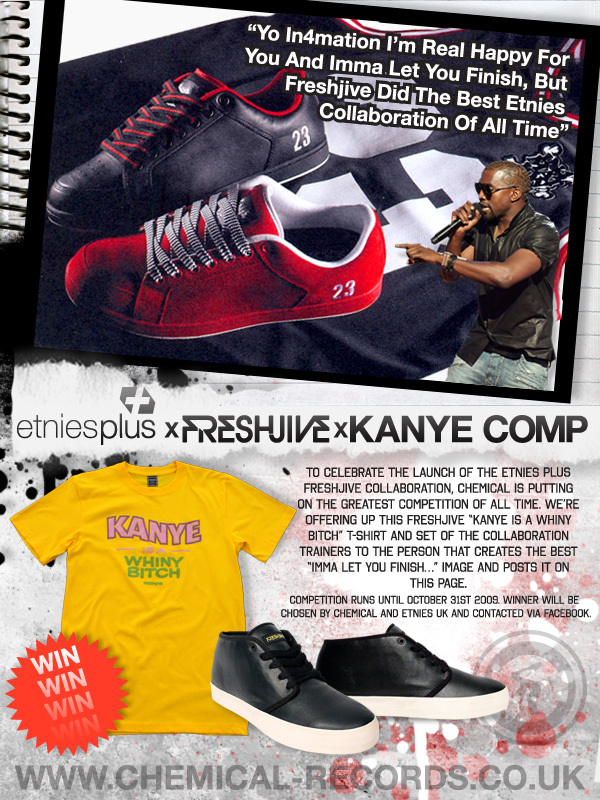 The Chemical Records “Imma let you finish” Kanye West influenced competition in conjunction with Etnies Plus X Freshjive is now open. All you have to do is come up with your best “Imma let you finnish…” quote and post it up on the Chemical Facebook page. Easy as that, the one that makes them laugh the most wins the goods! I am not feeling the T shirt personally, but the Freshjive trainers are heavy! So it’s worth entering just for them. To submit your entries head over to the Chemical Records Facebook page now! !